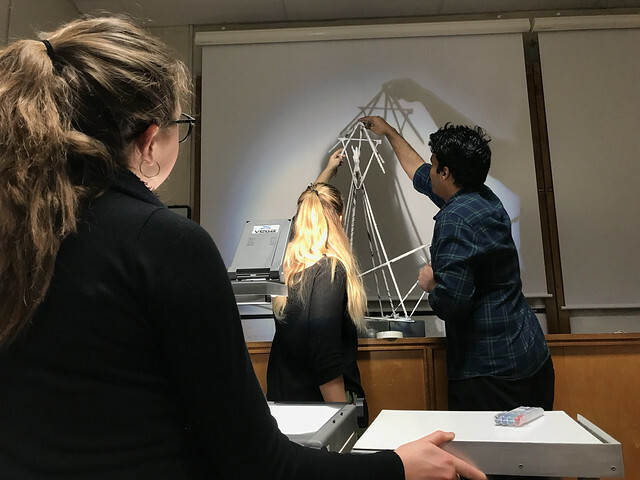 First year engineering undergraduates have been exploring water reflection, light and structure as part of extra-curricular art and drawing classes. These classes have helped to bring elements of engineering to life. In the first year of their Engineering degree, the students cover mechanics, structures, materials, fluid dynamics, thermodynamics, electrical engineering, electronics, information, control, and mathematics. They are also required to undertake two hours of laboratory experiments per week across all these subjects, alongside extra work, such as, attending engineering art and drawing classes. Spread over six weeks, the classes, delivered by Issam Kourbaj, Lector in Art at Christ’s College, covered the following themes relating to engineering: ‘reflection on water’, ‘playing with light’ and ‘playing with structure’. Visits were also arranged to Cambridge University Botanic Garden and Cambridge University Museum of Zoology for a closer look at structures that exist in nature and animal biology. Undergraduates Aleyna Yildirim and Naz Kabya said they had found the classes to be useful in helping to “bring to life” some of the subjects covered in the Part IA syllabus. Artist Issam Kourbaj advises undergraduates on the construction of their structure. “Issam’s art and drawing classes have really helped me to be more creative; I have worked with light projection, for example, to understand structures and the different angles structures form,” said Aleyna. “The classes have been very expressive and I’ve enjoyed not only looking at structural design, but also the challenge of building structures myself with reinforced newspaper. These classes have helped to bring elements of engineering to life,” said Naz. Artist Issam Kourbaj said the ‘playing with structure’ class had given the students the opportunity to explore both 3D structures and 2D structures, the latter of which was observed by studying the shadows cast by the reinforced newspaper structures the students had built, using a projector. “As an artist, it is all about taking inspiration from the world around you and making something out of it, about it, and in conversation with it,” he said. Dr Hugh Hunt, Reader in Engineering Dynamics and Vibration, added: "Our students get plenty of exposure to maths and computing. These art and drawing classes are an opportunity to redress the balance and take a look at the shape and form of everyday objects. The way things look and feel is just as important as the way they function." The text in this work is licensed under a Creative Commons Attribution 4.0 International License. If you use this content on your site please link back to this page. For image use please see separate credits above. Undergraduate Aleyna Yildirim with her group's structure, 'Bird with folding wings'.